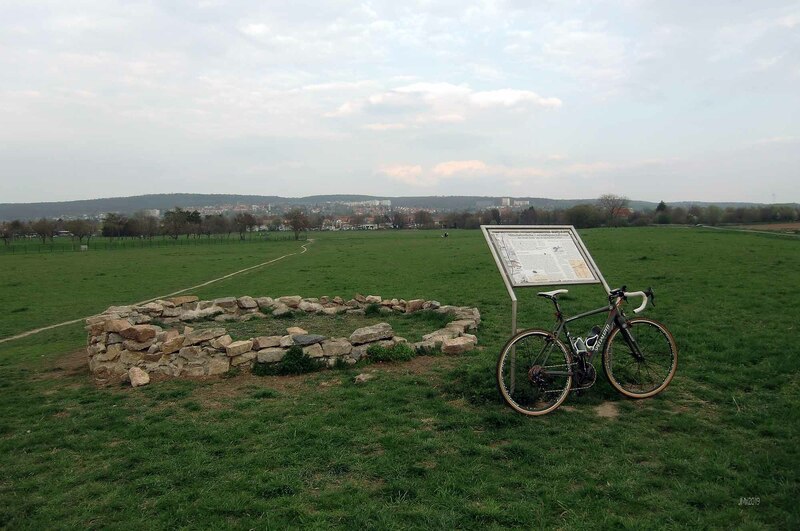 A 14 KM ride in 43 minutes early evening (6pm) saw me skip down the ‘Tilly Berg’ through housing and quickly onto the gravel paths that took me along the ‘watch towers’, across the Leine River, lingering at the Keissee Lake and onto the Bahn. Very few battles have been fought at this spot on the outskirts of Goettingen but the route along the Leine River Valley is an established route of march for past armies. The US 5th Army (if I recall correctly) came this way in 1945 as they headed to the Harz Mountains to take control of what Heinrich Himmler had declared the ‘Harz Fortress’ and thus open the road to Leipzig and Magdeburg. Previous to that during the earlier centuries a line of watch towers were built to over see the approaches along the Leine and some still stand whilst others are ruined reminders of the past. I turned for home at the local track and went back the way I came (almost).